The town of Walla Walla is one of the great wine towns in the Western US. It rivals that of Calistoga, St. Helena, Healdsburg, Sonoma, Paso Robles, and Los Olivos. A stay in Walla Walla puts you within easy reach of a plethora of tasting rooms and boutique wineries. The pace is slow and easy in the land of Walla Walla. Here is a novel idea. Main Street Drivers is a company that will drive you in your rental car or your own car for $35 an hour. Walla Walla Valley AVA is in eastern Washington and extends to the top eastern corner of Oregon. Over 70 wineries and 2800 acres of vineyards are located in the Walla Walla Valley AVA. The wineries are mostly small and family owned. Many are recent and are taking a bold and innovative approach in producing spectacular wines. From the town of Walla Walla, many of the wineries are only a few minutes away by car. If you don’t have a car, walk the tasting rooms in town. Revelry Vintners – young winemaker Jared Burns crafts fine wines. Aerials label is a collection of site-specific wines. They are spectacular, as is the tasting room. Solemn Cellars – another young winemaker, Justin Basil. The Syrah is one of the best in Washington. Amavi Cellars – beautiful setting and reasonably-priced wines that are excellent. Woodward Canyon Winery – starting date of 1981, delicious Sauvignon Blanc, Chardonnay and red wines. L’Ecole – tasting room is in a historic 1915 schoolhouse. One of Washington’s most award-winning wineries. Third generation. Step out of your hotel room in downtown Walla Walla, Washington, into a world of fabulous wine tasting. Within just a few city blocks, one can find 32 wine-tasting rooms. The Main Street area of downtown Walla Walla is a paradise for wine discoveries and delights. We say 32 plus because when any business storefront closes, a wine-tasting room moves in. We spent a few days in the town of Walla Walla. We walked out of the Marcus Whitman Hotel to roam the streets, amazed at tasting rooms one after another. All the tasting rooms visited had a reasonable tasting room fee of between $5 and $10. They also offer wines by the glass. The setting is comfortable and laid back. There are a couple of decent places with pub food but for a classy meal try the Whitehouse-Crawford restaurant. We had an excellent dinner there. Whitehouse-Crawford has an extensive wine list which includes many Washington wines. How to get to Walla Walla. Walla Walla has a small airport with daily flights from Seattle and Portland. Fifty minutes west is the Tri-Cities Airport, a much larger airport with more choices. Alaska Airlines has the biggest presence. There are drivers for hire, Uber, and renting a car. Many take the four-hour drive from Seattle and spend a few days in Walla Walla as well as the Tri-Cities area. We hired an Uber driver to get us back to the Tri-Cities Airport. Did you miss our article on the Yakima Valley? Who would ever believe that a small city with over 100 tasting rooms could exist without a single vineyard nearby? 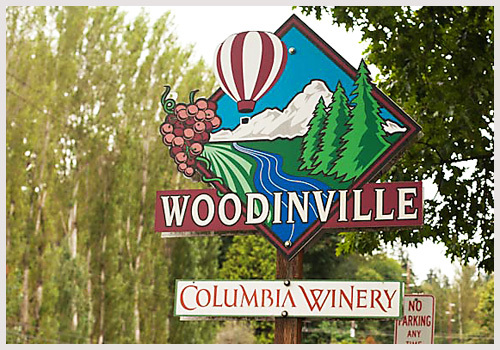 We are talking about Woodinville, WA, a town with a population of 11,000, situated 30 minutes from downtown Seattle. It all started when Columbia Winery and Chateau Ste. Michelle set up shop in Woodinville many years ago. Slowly but surely, tasting rooms began to spring up here and there. Today Woodinville is a mecca for small family-run wineries. I doubt if there is any city in the U.S. that has more tasting rooms per capita than Woodinville. We spent two days in Woodinville last week, barely enough time to get the lay of the land. We visited several tasting rooms, having a most enjoyable time and discovering the boutique wines of Washington. There are a few tasting rooms scattered here and there in Woodinville, but most of them are congregated in two areas, the Hollywood Hills and the Warehouse District. This area is a mix of tasting rooms, small shops, restaurants and wine bars. Four complexes within walking distance of each other make up the Hollywood Hills area. We started our exploration at the Purple Café and War Bar at 14459 Woodinville Redmond Rd. NE. “The Purple,” as the natives call it, has four locations all centered around the Seattle area. It is a terrific wine bar and one of the best we have experienced. The food is delicious as well. Just a few storefronts away from the Purple, we found very nice wines at the Sparkman Winery and William Church. In another complex is the Station Pizzeria with the Gorman tasting room and Phillips tasting room adjacent. 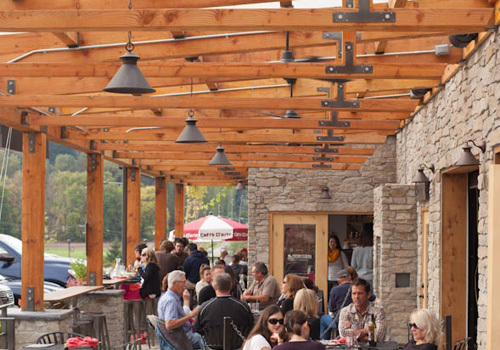 The three share a patio, and one can order from the Pizzeria and then order samples of wine from either tasting room. No worries about the weather because the heat lamps are always at the ready. It is a very relaxing way to spend an afternoon. The Warehouse District is a breed of a different color than the Hollywood Hills area. It is in a commercial area and as far as I could tell, has nothing but wineries in the industrial complex, perhaps as many as 50. Most of these are working wineries, making their wine in the back of the warehouse and showcasing their wines up front in their tasting rooms. Tasting rooms vary from elaborate to quite simple. At first, we thought the place was a little depressing with no scenic views of hillsides or vineyards. We arrived a little before noon, and the area seemed desolate, with very few wineries open. When we left, hours later, the warehouse area was packed with wine tasters. Since the wineries are small, you are likely to find the family members and winemakers working the tasting room. That makes for a much more enjoyable visit. The wineries of the Warehouse District are open to the public on Saturdays and Sundays from 12 to 5 pm, or for special evening events. All the wineries get their fruit from eastern Washington. At harvest, the grapes are shipped to wineries in the Warehouse District in less than four hours. We ran into one tour van that shuttled visitors to the various tasting room locations with a Hop-on-and-off type tour. One of the wineries we enjoyed on our Woodinville journey was Page Cellars. Here in a one-minute video where the owner and winemaker Jim Page tells us about his winery and others in the Woodinville area. Following the Wine Bloggers Conference in Portland, Oregon, we took one last look at the Northwest wine country with a trip to the Columbia Gorge wineries in Oregon and Washington. These wineries are about an hour to an hour and a half just east of Portland on Highway 84. What a terrific and scenic ride along the Columbia River! Without a doubt, this is one of the most different and varied wine countries we have visited in recent memory. When we were in college we used to drink Red Mountain wine, a very bad tasting but cheap gallon of wine you could buy at Walgreen’s for $1. It was bulk wine from the Central Valley in California made by Gallo and now a long discontinued label. Last week in the Yakima Valley we tasted several wines that had on the label the designation “Red Mountain.” We could not help but chuckle a bit as we thought about those long-ago Red Mountain college days in contrast to the wines we now tasted from the Red Mountain AVA vineyards of the Yakima Valley. These wines are lush and complex and some of the best wines we have ever tasted. The man most responsible for the development of the prized-Red Mountain AVA is Jim Holmes, who began growing grapes here in 1975. We were lucky enough to do a vineyard walk and listen to how he manages and grows the grapes of his Ciel du Cheval Vineyards. We are attending the Pre-Conference session of the Wine Bloggers’ Conference. It is a tough and challenging day of tasting fabulous wine and gourmet fare. Here we are in the Yakima wine country at the DuBrul Vineyards, what many think are among the very best vineyards in the state of Washington. The vines are growing on hillside terrain that overlooks the Yakima Valley. The vineyard owners, Hugh and Kathy Shiels, planted these vines in 1992. The Shiels have the label, Cote Bonneville, and after careful selection of grapes for their label sell the rest of the vines by rows to several wineries. Fortunately for us, we were able to sample some of the Cote Bonneville wines at lunch, and they are amazingly delicious. We would never be able to afford these wines at $120 for a beautiful red blend and $50 for a delightful Chardonnay. We join a vineyard walk led by DuBrul’s vineyard manager Larry Dolan. As we walk, Larry points out that to our right is a Syrah row of vines and to our left is a row of Riesling vines. It is somewhat remarkable that six varietals of grapes grow here and equally produce beautiful wines all within the same climate and soil conditions. As we walk across the rows, we can see down below that a crew of women is working to thin the vines. We move closer as Larry explains that some of the women have been at DuBrul for 15 years. They are well trained and need no directions from Larry. They work quickly in 90-degree heat and with precision cut the shoots that don’t belong to these prized grape vines. We hope these women are paid well; what they do is nothing short of extraordinary. Now it is off by bus to taste more Yakima wines at the Vintner’s Village in the town of Prosser. Prosser is a unique concept. About 12 wineries have set up shop here within a small area. Visitors can walk to each winery to taste wines and watch wine production in action. At the Milbrandt winery, all the vintners from the Vintner’s Village and other nearby wineries poured samples of their wines. We were particularly impressed by the overall quality of these wines. Our favorites were the Bordeaux blends which most of the wineries seem to produce. The wines are complex and most often smooth wines. In short, the Bordeaux blends of the Yakima Valley are outstanding wines. The day’s events have provided us with an excellent way to experience these wines. We are in the state of Washington until Monday for the 3rd annual Wine Bloggers’ Conference. We have tasted Washington wines before but never to the extent that we will be tasting over the next few days. Over 50 wineries are set to pour and entertain 300 wine bloggers. I’m anxious to find out about Washington wines and the geology and climate of the region. I want to learn all about the Yakima Valley and where that is in relationship to the Columbia Valley. And what about the Walla Walla wine region? What makes the Red Mountain such a highly-prized AVA? What issues do these winemakers have compared to elsewhere? It is dry and hot for sure. On Wednesday, a pre-pre-conference day for us, we visited three wineries in the Tri-Cities area near the Pasco airport. The first two wineries we visited had the Alsace Varietals of Riesling, Gewurztraminer, and Pinot Gris. I asked our host where these grapes were grown in relation to the red varietals. “Oh,”she said, “in the same area.” I doubt if that is the case but we plan to find out over the next few days. One thing I do know right off is that the days are much longer here than in California and thus affect the growing season. This morning I was awakened shortly after 5 am with a warm sun piercing through my window. Last evening we had a beautiful sunset overlooking the Columbia River at about 8:45. That is a lot more sunshine than we get in California. On Wednesday we started our Washington wine journey by visiting three wineries in Richland. They are all in the same area, and all three are within walking distance from each other. There are just a few vineyards in this area, and these three wineries get all their grapes from outside the area. Tagaris Winery is our first stop because they also have a restaurant and we are ready for lunch. With our lunch, we enjoy a glass of the Tagaris Gewurztraminer. The wine was very pleasant but lacked that Lychee nut characteristic that we like so much in this varietal. If you are in the area, we highly recommend Tagaris for lunch or dinner. The patio and inside area are very beautiful. At Tagaris we tasted six wines for $7.00. According to our host, almost all wineries in Washington have a tasting fee. Most return the fee with a purchase of wine. Next door, we visited the Bernard Griffin Winery. Things picked up here. The staff was very warm and friendly, and the majority of wines were very good to excellent. We thought the Grenache, Petite Verdot, and the Malbec were all very good wines. It is amazing to us that being treated well in a tasting room can make the wines and the experience so much more enjoyable. Our last stop was the Bookwalter Winery. Here they have two levels of tasting, and we chose the $5 tasting for their three top wines, all Bordeaux blends. Yes, these wines were excellent, smooth, velvety and complex. Perhaps a little too robust but very exciting wines. The price for each of these wines is $50. At Bookwalter, as was the case with Tagaris, our host was wine knowledgeable but lacked that inner quality to make us feel welcome and comfortable. Today is the pre-conference day for the Wine Bloggers’ Conference and about 50 of us will be bussed out to the Yakima Valley for a visit to wineries and a vineyard walk and lunch. We can’t wait to be entertained!